In the past, an initial rate hike would more or less imply that there would be a few more in the near future. And so people would buy the US dollar in anticipation of more hikes. So, effectively, the dollar was more or less a product of the Fed’s decisions. But now that the economy is trying to re-jigger itself after years of unconventional monetary policy, the dollar has become a factor in the Fed’s process, rather than a product of it. The main culprit for this abnormalisation is that FX is now hypersensitive to rates. This causes a feedback loop whereby not only is the FX market being dominated by expectations for future interest rates, but the plausible path for policy rates is being constrained by the strength of the currency. 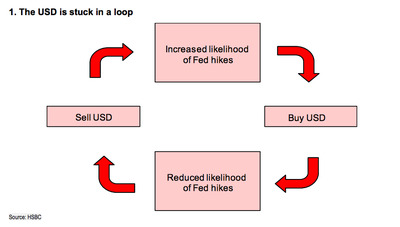 Regarding the “feedback loop,” what we’re seeing is that a weaker US currency increases the probability of a US rate hike, which prompts folks to buy the dollar, which then results in a stronger dollar, which then reduces the likelihood of a hike. 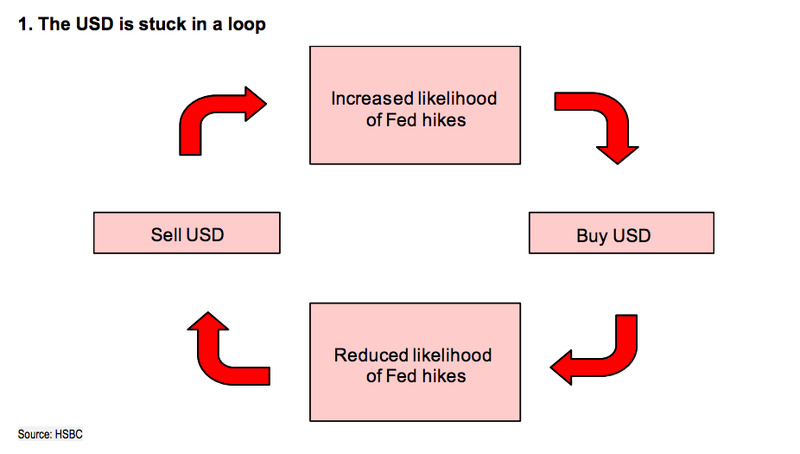 As for what this means for traders, the HSBC team argues that buying the dollar with the expectation that a rate hike is coming could be a mistake. “According to Fed calculations, a mere 4% rally in the USD is equivalent to a 25bp hike. For a market which is debating whether the Fed may move once or twice this year, even a small rally in the USD will swing the abnormalisation process back towards the doves,” them wrote.